Joyce Grenfell was a popular English actress and entertainer whose career spanned nearly 40 years and several continents. She made her stage debut in 1939 and toured North Africa, Southern Italy, the Middle East and India performing for British troops in World War II. Although she appeared in a number of films, she continued to record her music and humorous albums. She worked on the BBC and acted in one-woman shows. She's still remembered today as one of Britain's top comediennes. 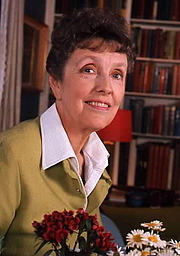 Joyce Grenfell is currently considered a "single author." If one or more works are by a distinct, homonymous authors, go ahead and split the author. Joyce Grenfell is composed of 2 names. You can examine and separate out names.